DMB wanted to create an atmosphere that emobodied the spirit of the Southwest in their premier DC Ranch Community located in Scottsdale, Arizona. Roadway sections for the project had oversized medians with rolling and curved geometry to flow with the natural curves and elevation of the terrain. Desert landscape materials were carefully designed to create harmony with the surrounding native landscape and vegitation. In keeping with this theme, special traffic signal poles were designed to appear as a natural wood material. This was accomplished using high strength steel reinforced concrete poles. 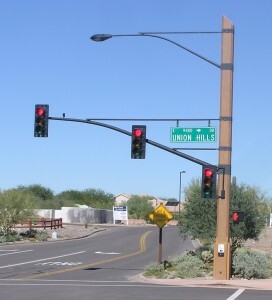 Wright Engineering coordinated with Ameron Pole Products, DMB, and the City of Scottsdale in the design of numerous traffic signalized intersections within the DC Ranch Community.